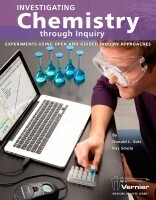 Produktinformationen "Investigating Chemistry through Inquiry"
The Investigating Chemistry through Inquiry lab book contains 25 inquiry-based chemistry investigations. The book is authored by two long-time chemistry teachers, Donald L. Volz and Ray Smola, who have enjoyed using the inquiry method in their own instruction. Each experiment includes a preliminary activity, teacher information, sample researchable questions, and sample data for those researchable questions. If you are new to inquiry-based instruction, the extensive Instructor Sections that are included with each investigation will help guide you through the inquiry-based style of chemistry instruction. Weiterführende Links zu "Investigating Chemistry through Inquiry"
Garantie(Jahre) "Investigating Chemistry through Inquiry"
Weitere Info "Investigating Chemistry through Inquiry"
Kundenbewertungen für "Investigating Chemistry through Inquiry"